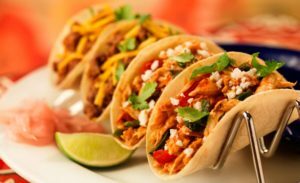 You will find different types of tacos, but the original recipe is with a corn tortilla and filled with meat, it can be chicken, or beef or pork. You can choose want you want. On top of it you put some mixture of onions, tomatoes, cilantro and you can also add chilli but watch yourself! That’s really spicy and if you are not used to it you will be crying. You also can eat fish tacos, but they are less popular. They can be eaten in a restaurant. You have to know that tacos are eaten with hands, you will never see a Mexican eating tacos with a fork or a knife. NEVER! They will look at you weirdly if you do it. You can eat tacos everywhere in Mexico. You can find them at every hour of the day and at every corner of the street. They can be made with corn or flour tortillas. There are filled with cheese and then grilled. You can also add a mixture of spices or vegetables to it. They can be of one or two tortillas. 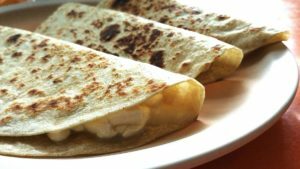 Depending of the region you can find quesadillas filled with cheese and also with the meat of your choice. You can eat quesadillas everywhere in the streets like tacos. There are cheap and really good. You will such love them that you will even cooked some at home. Simple and quickly cooked you can eat them served with a salad or whatever you want. 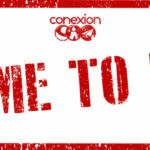 – Pozole: soup or not soup? 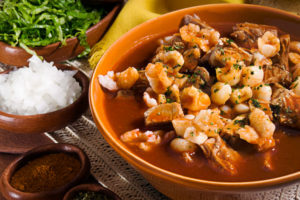 Pozole is a traditional soup in Mexico. it’s made from hominy, meat and seasoned with chillis, onions, radishes, garlic, avocado and limes. You can find it in every restaurant you will go to. Even with the heat outside you will enjoy this dish. The Ceviche is a traditional dish in Mexico. The basic ingredient is white fish but it can also contain shrimps or other types of shellfish. It also contains tomatoes, purple onions, cilantro and lemon. You usually eat it on a “tostada” with kind of like a toast. 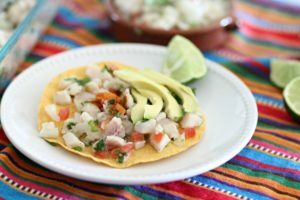 The Ceviche is usually eaten on the coast because it’s made with fish recently caught. This isthe perfect dish for a picnic on the beach! 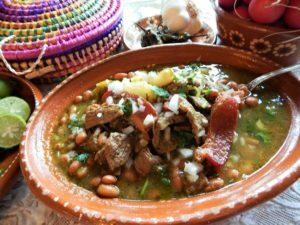 – Carne en su jugo: representing Jalisco state! 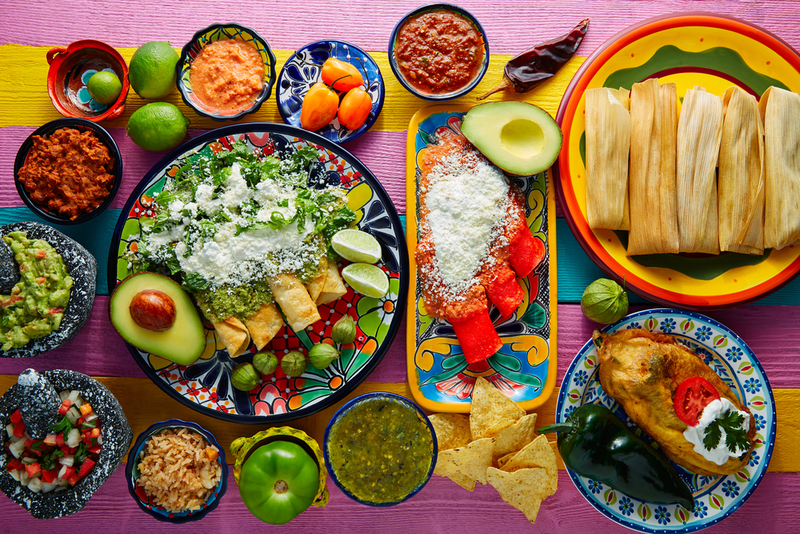 This is probably the most Mexican dish you will try in Jalisco. It’s basically beef meat slices in his own juice. The all thing with beans, cooked bacon, onions and cilantro. Normally you eat in a plate made out of clay. You can eat tortillas with it, and beans with a touch of lemon of course. 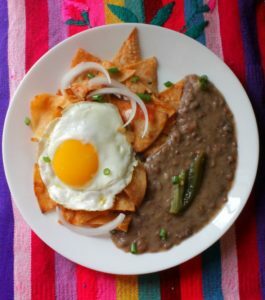 – Chilaquiles: typical breakfast ! This typical dish is loved by all the Mexican. It’s the typical breakfast. It’s composed of fried eggs with tomatoes sauce, mashed beans, and the ultimate part is fried tortilla strips simmered in red or green salsa or mole to soften the strips. Chilaquiles is eaten daily in Mexico, you will find this dish in every restaurants or hotels. – Enchiladas : Be careful it’s spicy! 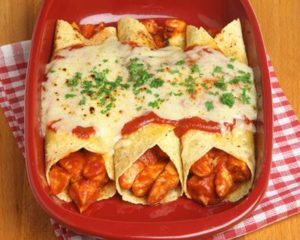 Enchiladas are corn tortillas basically rolled, filled with meat, cheese, sometimes vegetables, potatoes or beans and topped with a chilli sauce and baked. Once again, this dish is prepared differently through Mexico, you can make it with different types of meat, add vegetables or no, and add tomatoes sauce with or without chili. But the basic enchilada is made with chili, I, fact his name came from “enchilar” which means “add chilli”. 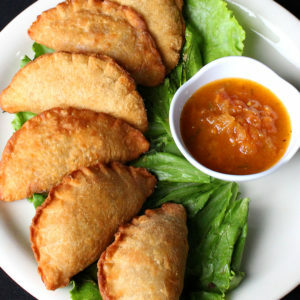 – Empanadas : what a good appetizer! There are part of the “antojitos mexicanos”, they are snacks that are really appreciated in Mexico and everywhere in Latin America. They can be cooked in different ways, it depend where you are. For example in the north they prefer eating them with sweets ingredients. And by the coasts they eat them filled with shellfish like shrimps or octopus for example. In reality, if you cook them, you can make them with everything you like and it will be very yummy! 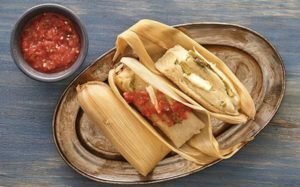 Tamales are a traditional recipe which is made of dough usually corn-based which is steamed in a corn or banana leaf. You have to discard the wrapping before eating it. They can also be filled with meat like chicken or pork, with cheese or more rarely with vegetables. There are many variety of mole in Mexico. But his basic version is made out of cacao, chillis, tomatoes, almonds, cinnamon and others kind of spices. Often you eat mole with chicken, which is a really great combo. 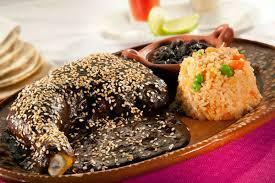 It exists different types of Mole like: Mole Poblano, Mole de Oaxaca or Mole de San Pedro Atocpan. 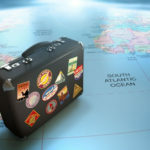 10 things you need to bring in your suitcase to live in Mexico! 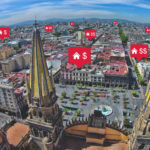 ¿Cuánto cuesta vivir en Guadalajara?